What can I say? Work is frantic at the moment and consequently my blog and twitter stream are a great deal quieter than normal. That’s academic teaching for you. However, we’re now almost through our first semester here in Australia and over the past few weeks I’ve been able to refocus on my research. Before I blog about those projects though I thought I would cover a few teaching related things that I’ve been up to this semester. I ran an archaeology field methods short-course in April at a place known as Warriparinga, an area of parkland here in Adelaide that has an interesting range of Indigenous and European heritage features. It’s not the most exotic location for a fieldschool, but it was perfect for an introductory field methods course because it was close by, safe and had a variety of features for students to think about. 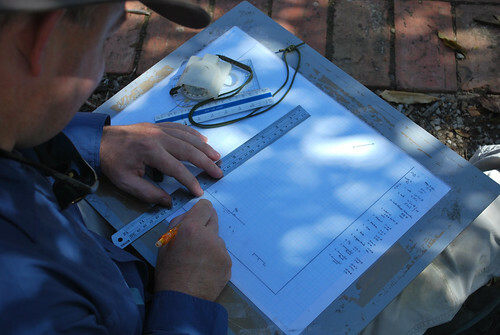 The fieldschool was oriented at students in our graduate program – many of whom had little or no field experience – and aimed to assist them to learn the kinds of skills that they will need in day to day archaeological work in Australia. I guess you could call them the ‘bread and butter skills’: tape and compass recording, GPS use, field survey, site recording/site survey, drafting plans, photography and so on. I asked them to treat the project just like a ‘real world’ field survey project and so in their teams they were required to develop a research question and then attempt to address that using the variety of methods that we introduced. I’m yet to mark their final reports, but my brief glances suggest many look very good and I can see that a lot of students have gone to a great deal more effort than I expected. I’ll definitely run fieldschools like this in future since it makes students think about what they’re doing (and why) and gives them ownership of their projects on a day to day basis. This is good preparation for doing archaeology in a real world context where they’ll be expected to be able to manage small projects from survey stage through to the final report fairly independently. Next year, we’re expanding to include a similarly run fieldschool focusing upon excavation. 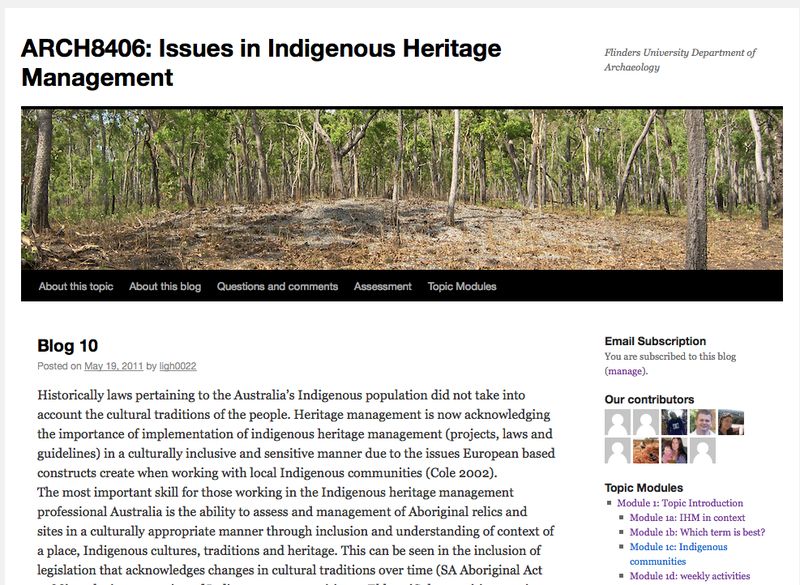 Early this year I trialled a blog in a distance topic that I teach on Indigenous heritage management in Australia. I used the standard WordPress.com service and students seem to have had no difficulty creating accounts, writing blog posts and commenting. Because this is a distance topic, we write fairly lengthy study guides delivered in weekly modules which essentially replace lectures. I released each module as a blog page each week during the semester and for each module they were required to read the study guide and set readings then write a ~250 word blog post addressing a set question. It was an attempt to make a fairly dry distance topic a little more dynamic and engaging, with the opportunity for them to comment, ask questions and to share other resources of relevance to the topic. I think that one reason content wasn’t read very often was that it was difficult to find and visitor attention was taken up by the most recent post (see image above). I would suggest then that the format of a blog oriented at teaching distance students is critical. The front page needs to have minimal text showing a series of headlines with short summaries of what they contain, and it needs to be arranged so that students can see what is available at a glance – without too much to distract them. I’ve sought their feedback as well, so it will be interesting to see what that comes back with. In short though I found the standard WordPress.com offering far too limited to run a decent class blog. Next year, I’ll use either a self-hosted installation or find another service entirely. Any ideas? In other news, I have created an Archaeology at Flinders group on Flickr which will complement our recently launched Flinders Archaeology Department blog site, which you can find here. I’ll get another post up later this week about the various research projects I’m working on at the moment.